my work is in the Colonial and Folk Art styles. selling them on e-bay and to re-enactors for demonstration purposes. 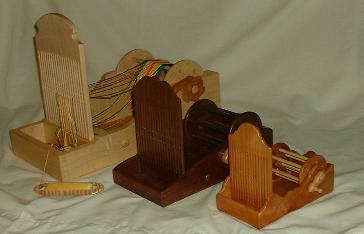 For those not familiar with tape and paddle looms (also known as box, band. or trim looms) - a little history. simple to operate and an excellent introduction to the weaving process. bookmarks, and other decorative and useful items. with each loom. Pre-threading is also available at no additional charge. Custom designs and special orders will be considered. Thank you for your interest in my work. Please enjoy your visit!.